When buying indoor plants, make sure that you pick a healthy plant that is great in shape, has no signs of disease or damage, and is ready to be transferred to the intended environment. When you are buying indoor plants, make sure that you understand their growing conditions and have sufficient space to provide them. Once you have decided what indoor plants you want to buy, make sure you select the best available indoor plants available in the garden center. The following tips for buying indoor plants will help you select the best plant and avoid costly mistakes. Look for healthy foliage and sturdy stem. Avoid plants with drooping leaves or foliage showing signs of discoloration. Do not buy plants with damage or weak stem. Look for firm stem with no signs of damage. If you are buying a seasonal flowering plant, pick the plant with lots of unopened buds. Avoid plants that are end of their flowering cycle. Carefully watch buds, under the leaves, and tips of new stems for insects. Do not buy plants that carry bugs. Also watch for eggs and larva. If you have already brought home an infested plant, immediately isolate it from other plants and treat the affected plant. Make sure that plants roots of the plants are not growing out of the pot. Roots growing out of the pot suggest that the plant has been potted in the same pot for a long time and it would be difficult to transfer it to another pot and that transferring the plant to another pot would put a lot of stress on the plant. Always pick smaller indoor plants. Not only they cost less but also adjust easily in their new environment. You can also prune and train smaller plants to your desired shape. 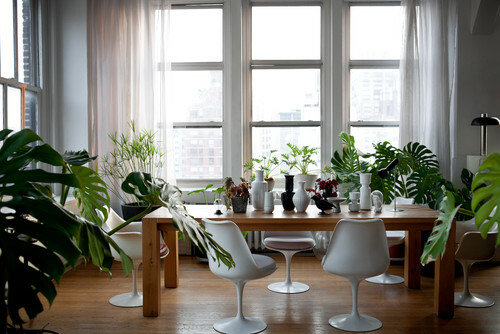 Buying smaller indoor plants also gives you freedom to fit them easily in available space. Check the soil carefully. Make sure that it is not soggy or very dry – clear sign of neglect. Do not place your new plants under direct sunlight. It is advised that new plants should be kept under indirect sunlight for a few days so that they can adjust to their new climate. If you are buying flowering plants, place them in the spot that is best suitable for them so that they are not stressed in the process of acclimatization. Flowering plants, when not provided with the right climate, may shed their flowers and buds immediately. When buying indoor plants, make sure they are handled carefully during the transit. It is advised that they are properly wrapped and provided sufficient support during transfer.